This comes under one of my pet peves —– short-sighted employers. All this will change the retirement patterns for large employers (in ways they may not like) because with disappearing annuity pensions and the added financial burden of health insurance, who will be able to retire? In addition, looking at the bigger picture the declining disposable income of future retirees may well mean less spending on the goods and services sold by their former employers. It may also increase pressure for more government subsidized everything thereby increasing taxes on 🤑🤑🤑🤑 working Americans and, you guessed it…those short-sighted employers. Employer- and union-sponsored retiree health benefits have served as an important source of supplemental coverage for people on Medicare, but over time, this coverage has been eroding. 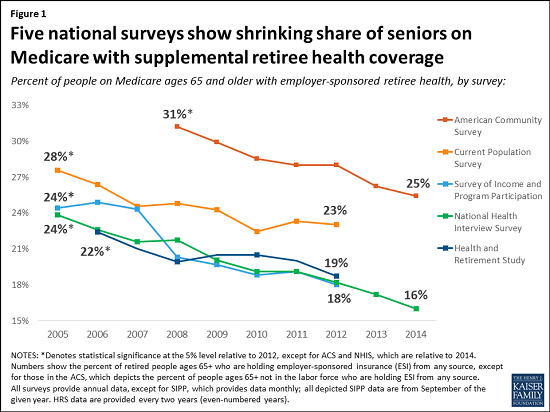 This Data Note draws upon five national surveys to document the decline in retirement health insurance coverage, and discusses the implications for seniors and retiring Boomers. Actually, benefits professionals expect to see the trend shift again. It is true that, like the defined benefit pension plan, employer financial support for post-employment medical coverage is waning. That trend will continue. But what it really represents was, just like the politicians, corporate benefits and HR leaders who over commit and under fund their benefit plans. Nothing stopped those who adopted post-employment medical coverage in the 1950’s and 1960’s and 1970’s, both before and after Medicare took effect in 1966, from funding their commitments or vesting their benefit promises. They intentionally did not – just like the politicians when it comes to Social Security and Medicare. – Employer-sponsored, retiree pay all, Medicare Advantage exchanges. – Pre-tax for FICA and FICA-Med. Earnings are tax deferred so long as they remain in the trust. – Penalty tax free (taxable as ordinary income) even where not used to reimburse qualifying medical expenses (say to buy a boat), where they are paid out following death, disability or reaching age 65. – Employer-sponsored Medicare supplement premiums. So, while we are only in the infancy of Health Savings Accounts (available since 2004), there is already $30+ Billion in assets spread across over 17 Million accounts. While only 14% of those assets are actually invested (the rest is in Money Market accounts), that percentage is climbing quickly. So, the role of employers with regard to retiree medical has changed – facilitate savings by offering a HSA-qualifying HDHP, and facilitate coverage by offering retiree-pay-all medicare supplement coverage through an exchange process. Instead of complaining about employers who, in the past, over committed and under funded, let’s encourage today’s employers (including the majority of employers who never offered retiree medical) to facilitate retirement preparation and retirement with an offer of savvy funding and coverage options. The cost to the employer is minimal, the potential return to the worker (and the employer) may be significant. Facilitating in fine, but they are also largely facilitating retirement income as well. All employers are doing is setting the stage for more and more government in this area meaning less control for employers while paying higher and higher taxes. Employers have done this for years; acted in their own short-term interests and then complained when they are faced with costs, laws and regulations that eventually come to be to fill the gaps created by employers. Most employers never offered retiree medical, and never will. The fact that democratic socialists like President Obama, Hillary Clinton and Bernie Sanders believe these are “gaps” to be filled by taxpayers and government as part of a nanny state is certainly true; but if it weren’t state and federal mandates for active employee health insurance, and now, state-mandated IRAs, it would be something else. We’ve seen their work in this space already, by taxing you and me (and sticking it to shareholders and bondholders in bankruptcy) to provide retiree medical that far exceeds anything almost all Americans will see in the form of public employee retiree medical and funding for the UAW VEBA trust. Democratic Socialists will regulate everything including, as we are finding out these days, who can defecate where … so … I doubt they will be stepping into the retiree medical space here just because a minority of employers who once offered retiree medical have scaled back their plans. They only seem to care about represented employees – where they can reasonably rely on votes. In the short term, I think they will keep their distance – maintaining the status quo in the form of state limits on insured, Medicare Supplement design. More likely, they won’t show up here until the Baby Boomer burdens on Medicare become fiscally unsustainable, and they will propose actions in an attempt to offload their prior promises regarding Medicare … as part of the same old, same old, tried and true vote buying process – over commit and under fund, under deliver. It will be positioned the same as before – with the Republicans pushing granny in her wheelchair off the cliff. here is a perfect example, issued on May 5, 2016, of what you state, and it confirms my response as well … because, as you know, today, more Americans are covered by employer-sponsored retirement plans (DB, DC, profit sharing/401(k), 403(b), 457) and IRAs than at any time in America’s past. Or, how about this one, almost 500 pages on incentive compensation regulation for financial firms subject to Dodd Frank – what does this have to do with with mortgage-backed securities from eight years ago in 2008? Bottom line, it makes no difference to the nanny, regulatory state whether a few more employers dump retiree medical coverage. While they ignore the fact that when all is said and done the root cause of the crisis was the push by government for home ownership and sub prime lending. What scares me most is the ease with which people accept scapegoats and are happy to ignore any personal responsibility. Sen Warren wants to change the law again and disallow the corporate deduction for performance based compensation while continuing to mislead on what executive compensation really is.